For many years I’ve been quoting a rule, that 80% of a job can be done in 20% of the time. And that the remaining 20%, will take the remaining 80%. 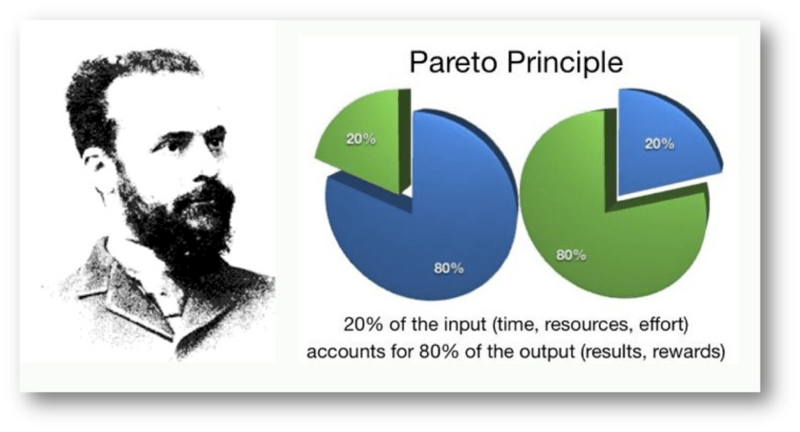 Today I discovered the name of this principle, The Pareto Principle. Simply put, the final 20% of any project is the fiddly, finicky parts of the job which require lots of extra time. This means in the early stages of any project, you seem to make massive strides, building the framework upon which everything else is hung, and this makes the project look easy. However, the final 20%, consists of the fine tuning, and lets be honest, the hard bits that you were probably avoiding as you knew they’d swallow up a whole load of time to get done. The inverse of this is however, if you’re willing to accept a project only 80% as good as it should be, you can probably get it done in only 20% of the time. Which is useful for prototyping, where the rapid progress will allow you to see the way a project will look and generally feel, before you invest the rest of the time into completing it. Or projects which may only require 80% of the quality, and may not actually need the rough edges removed and the polish put on which will take the 80%. Microsoft for example noted that by fixing the top 20% of the most-reported bugs, 80% of the related errors and crashes in a given system would be eliminated. It is also noted in business, that 80% of your sales come from 20% of your customers, and the rule itself was named after Italian economist Vilfredo Pareto, who noted that 80% of the land in Italy was owned by 20% of the population, and that 20% of the peapods in his garden, provided 80% of the peas. So, no major revelations from me today, just finally a name to something I’ve been quoting for many years without being aware that it was actually a real “thing” with a proper name. The Pareto Princple, also known as law of the vital few, and the principle of factor sparsity. Fancy that.